At the risk of getting all sentimental, Robert and I wanted to spend our last PNR podcast revisiting some of our favorite discussion topics, recalling a few of our personal content marketing triumphs, and passing along a bit of advice we’ve received over the years in the hopes that it will help you achieve greater triumphs in your own career. Below are a few of the highlights, which we are sharing here as a thank you to all of our listeners for following our journey through 211 episodes of Pulizzi & Rose: This Old Marketing. Of course, we encourage you to listen to the podcast to hear the whole conversation, along with a few little surprises. The entire PNR experience has been a labor of love for Robert and me – and the response from our audience has been both humbling and gratifying. We hope you take our thoughts to heart (though perhaps a few of them should be taken with a grain of salt, too) and that they encourage you to discover what you are most passionate about – as a content marketer and a person. Joe Pulizzi: I believe that some time next year there is going to be talk of this happening, and it will be consummated some time in 2019. Then, I’m going to say, “I don’t know what took them so long.” But they’re big companies. It’s complex. Mergers and acquisitions of these type, they don’t just happen overnight. Of course, I’ll probably have to be consulted in the decision. Robert Rose: You can just get over yourself because it’s not going to happen. But here’s what is going to happen. Disney is going to make a purchase, and it will do so before the end of the year. That purchase will, of course, be 21st Century Fox (Editor’s note: This deal was confirmed on December 14, 2017)… I think it’s a great deal – it’s the reunion of Marvel. It makes perfect sense. Overall, we’re starting to see increasing consolidation of media. That consolidation is all about gaining access to audiences, which of course is what we’ve been preaching for a long time. So, advertising is not going away, and content marketing is not going to replace it. But, I think that those companies that are truly innovative, that truly have a strategic way of thinking and looking at the approach of content marketing, are going to be very successful with it. RR: I think paid media and advertising are going to go into a renaissance. I think there could be something disruptive in the advertising space, in much the same way that search advertising disrupted the space in the early 2000s. It could be some combination of native plus human-curated content, plus artificial intelligence… something where high-quality paid placement of content will begin to really innovate this space. And it’s a space that needs to be innovated in the worst way. JP: There’s nowhere else to go. Just kidding. No, there’s a lot of really good ones out there. I listen to Mitch Joel’s Six Pixels of Separation podcast. For a different twist, I really like what Jay Acunzo is doing with Unthinkable. Though it’s not a marketing podcast, I also listen to The James Altucher Show – I like it because I get a lot of really good story-writing ideas on things that I didn’t necessarily know a lot about before. For content creation, the Copyblogger FM podcasts are all good. They really talk about different forms of content creation, from audio, to textual, to video. RR: I would second all of those, and would also add in Exponent – the James Allworth and Ben Thompson podcast. I listen to it weekly – though it’s more of a cultural investment in technology than a marketing-specific show. I also like the Entrepreneur on Fire podcast, HBR’s Ideacast, and The Tim Ferriss Show. And if you’re on the small-biz side, I’d recommend the Duct Tape Marketing Podcast by John Jantsch. RR: I would point to two things: The first is when I gave up on climbing the corporate ladder and decided to join friends at Crownpeak (a tech startup) to work with something I could be passionate about and love doing. The second one was when my wife and I decided to move to Washington, DC from LA. It was this decision that helped me get focused on my business goals. Before that I was focused on form over function – life goals, rather than business. In DC, I met my spiritual mentor, who helped me see a need to re-pivot my goals around the function. It was the best move I made because it helped me realize that I had achieved all my goals – just in a different form than I had envisioned. So, the advice I would like to pass along to college students is: Don’t get caught up in the form, think about the function of what you want to do every day, and that will lead you to more happiness and satisfaction. JP: Go learn how to build a loyal and trusted audience. Create fantastic experiences throughout any content and storytelling you create. If you can do this effectively – around photography, or butterfly catching, or whatever you like to do – when you go in for a job in content marketing and you can say, “I built an audience, and this is how I’ve done it,” you will absolutely pave your way to any job you want. Build a loyal & trusted audience & it will pave your way to any job you want, says @joepulizzi. Coming and going matter far more than what happens in the middle, says @ThisIsSethsBlog. Opening things, closing them, tearing off the bandage, losing something, meeting someone new, getting on the airplane, getting off of it, being greeted, elections, ending a feud. We mistakenly spend most of our time thinking about, working on, and measuring the in-between parts, imagining that this is the meat of it; the important work. In fact, humans remember the transitions because it’s moments of change and possibility and trepidation that light us up. I’ve had the immense pleasure of being part of 200+ productions of This Old Marketing with my friend and brother, Robert Rose. Each one of those episodes provided some learning for me, and hopefully for you. But of all those episodes, I’ll remember the decision to launch and produce the first episode and the one you just listened to, our last episode, the most. These two moments will always stick out as special in my mind. Is Seth right? Is it the beginnings and endings that matter? To grow and ultimately to reach the goals we set, we need to make big decisions. I hear and see this every day with the listeners of this podcast: “We need to fire an agency or a content creator… or hire an agency or content creator.” Sometimes we need to kill off one program in order for another one to flourish. Sometimes we need to take a stand for what we believe in… and sometimes we have to walk away. Staying in the middle like stasis is always the easiest course. It’s also the most dangerous. In my experience, that’s where most of the universe lives, in the middle – safe and without risk, but also without growth. The short-term pain of the decision usually ends up being worth it because of that amazing possibility of making something truly great. Is ending this podcast a good decision at this time in this place? I think so; but we could be wrong. As Amelia Earhart so famously said, “The most difficult thing is the decision to act.” Robert and I are acting by closing this chapter called This Old Marketing. Frank Herbert says, “There is no real ending. It’s just the place where you stop the story.” With your help, Robert and I have told our story, but this is not the end. Now it’s your turn to turn the page and hopefully take a little bit of this podcast with you. Thank you for being part of this amazing journey with us. Now, it’s your story to continue to tell. Tell it well. 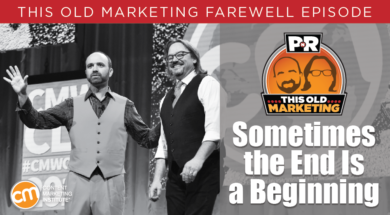 The post This Old Marketing Farewell Episode: Sometimes the End Is a Beginning appeared first on Content Marketing Institute.